Last month we both celebrated our birthdays in Bhutan. Birthdays are not a big deal here, in fact traditionally everyone celebrates having made another revolution of the sun on the first day of the year. Many don’t know exactly what day they were born as registers of births were rarely kept. One birthday that is observed, however, is Lord Buddha’s birthday (or Lord Buddha’s Parinirvana) which is recognised with a public holiday each year. This year it fell on the Friday between our two birthdays. 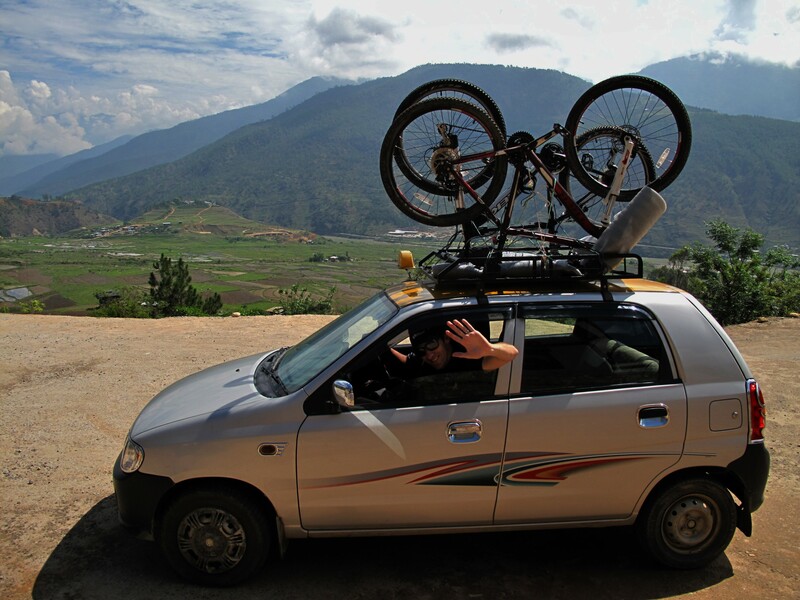 So we took the opportunity to throw our bikes on the top of a taxi and head off for a cycling long weekend in the Punakha valley, the next valley to the east from Thimphu. 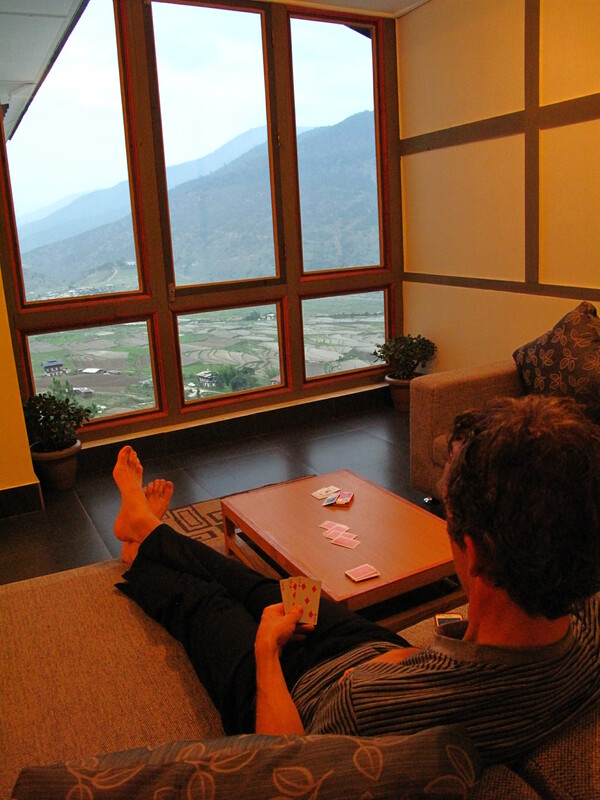 Punakha valley is much warmer than Thimphu valley, being at a lower altitude (1250mASL). We stayed at a fairly new hotel where the staff were incredibly friendly, the food was great and the décor the perfect balance of contemporary and traditional. It had a fantastic view looking out across rice terraces towards Chimi Llakhang, the temple dedicated to the “Devine Madman” (Drukpa Kunley). This guy was a 15th Century monk famous for his unorthodox teachings – assisting women to find enlightenment via the use of his ‘flaming thunderbolt’ and basically getting people to loosen up and not take themselves so seriously! You could say he was the Saint of “keeping it real”. His legacy now manifests itself in the wooden phallus and dagger hung from the corners of traditional homes, the painted phalluses adorning exterior walls of houses (no, it’s not graffiti! ), the ‘joker’ characters that stir the crowds at festivals with their distinctive phallus headpieces, and of course this temple in Punakha valley dedicated in his honour. Many couples visit to pray for children and couples with newborns bring them here for blessings. 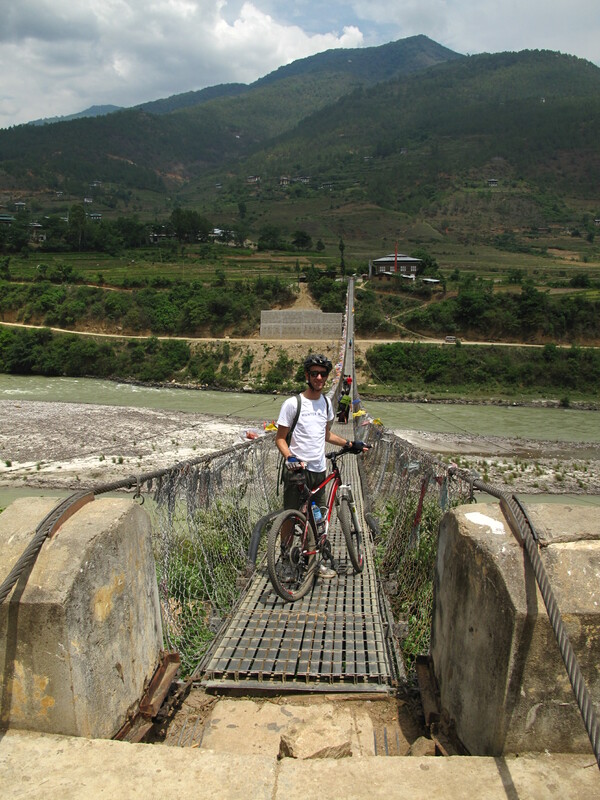 The Punakha Valley seems to be made for taking in the sights on an easy day ride up one side of the valley and back on the other. We stopped for a picnic overlooking Punakha Dzong which sits strategically at the confluence of two rivers (the Mo Chu and the Pho Chu). The picnic area is maintained by the students of Punakha Higher Secondary School across the road. As we sat and admired the view a group of otters swam by, swept along by the strong current. We even found a secluded safe spot to have a quick dip ourselves in the icy cold river to cool off! 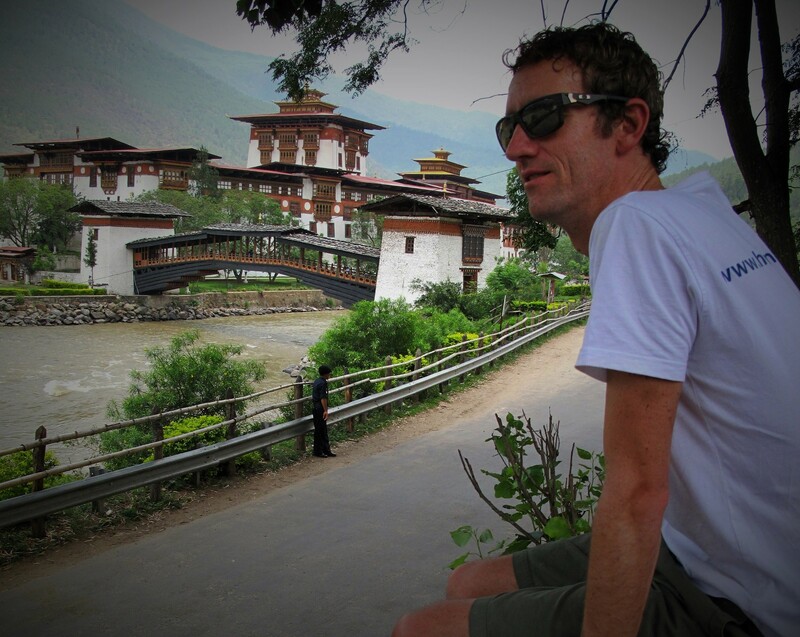 Punakha Dzong is accessed by a traditional cantilever footbridge over the Mo Chu river. 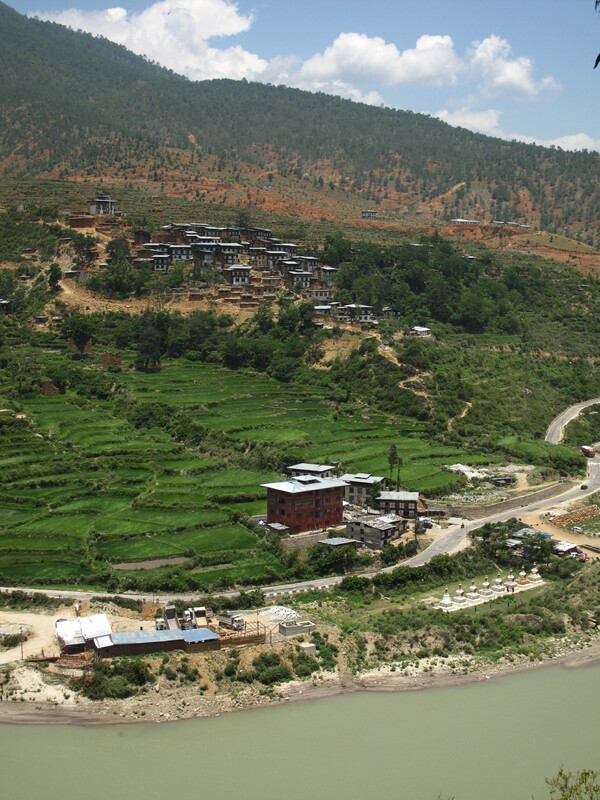 It is easy to see why it’s considered one of the most picturesque Dzongs in the country. 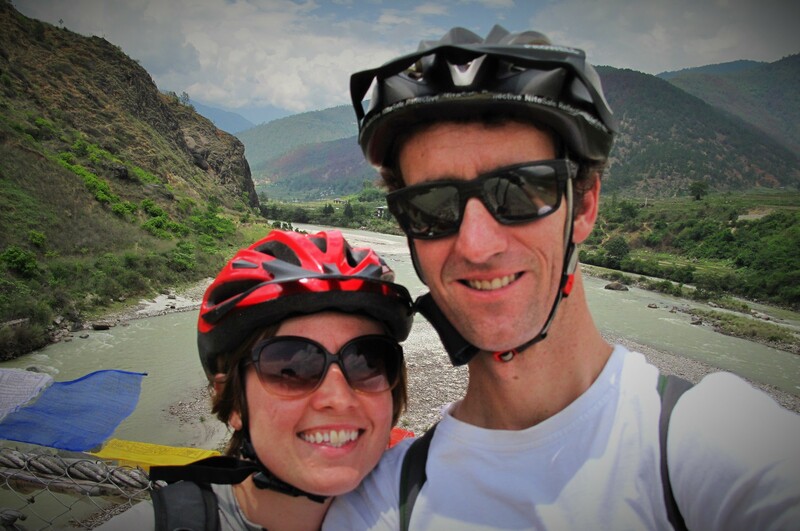 To cross the Pho Chu river we pushed our bikes across Bhutan’s longest suspension bridge, measuring 200m long. And then rode back along the eastern side of the valley. The Bajo new town is probably an example of how not to do town planning. Up the hill from here is the ruins of Wangdue Phodrang Dzong, which burned down in 2012. The Dzong was undergoing restoration works when the fire broke out. I met the Architect who was in charge of the project and he told me how heartbreaking it was as he had been attending a conference on Heritage conservation in Norway at the time. Across the other side of the river from Wangdue Phodrang Dzong is a cluster of traditional houses stepping up the hillside with the village temple at the top. We probably wouldn’t have discovered it if it hadn’t been for the lovely French lady we met at our hotel. We wandered up the narrow alley ways between the tightly packed rammed earth houses and were befriended by 3 small children and their basketball. They were fascinated with Jordi’s trick of spinning it on his finger. They guided us up to see their village temple at the top of the hill, and the fabulous view of the valley from there. Altogether, an excellent weekend. 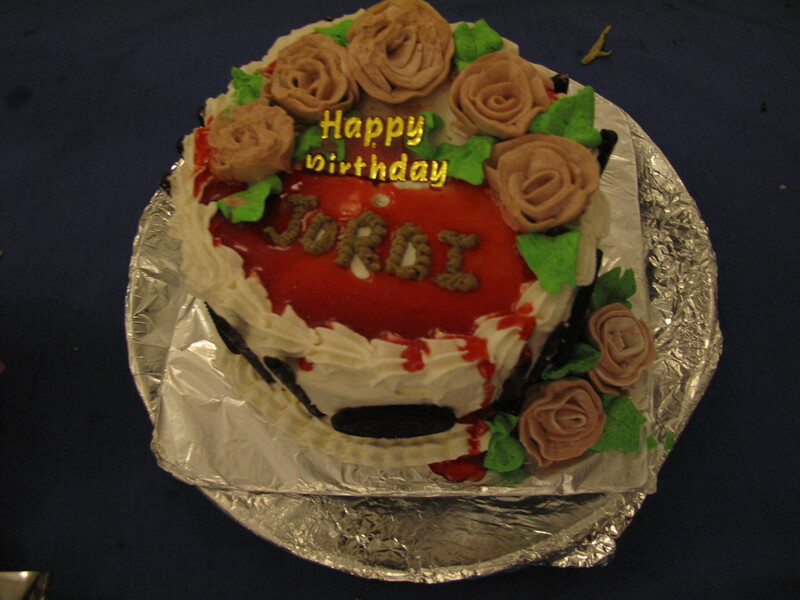 The kitchen staff at the hotel were even able to whip up a birthday cake at short notice! This Post was tagged Cylcing in Punakha Valley, Devine Madman, Drukpa Kunley, Hotel Vara, Punakha, Punakha Dzong, Wangdue Phodrang Dzong. Bookmark the permalink. It’s great to see your news. We miss you at choir.